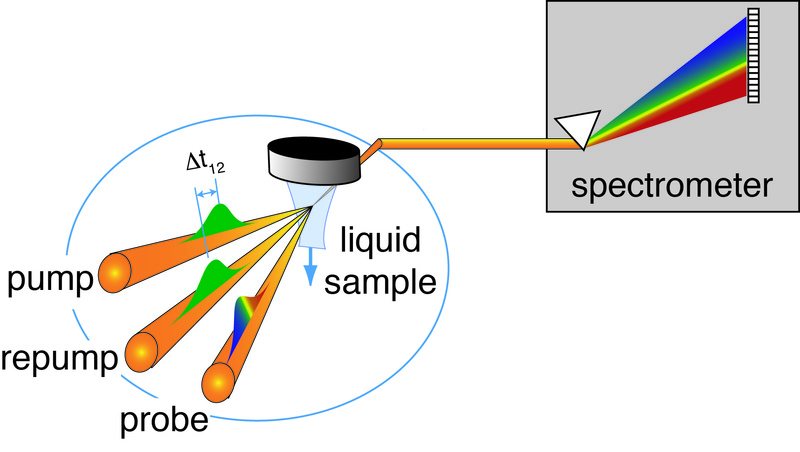 In pump-probe (PP) spectroscopy, we use two very short pulses of light from an ultrafast laser to first excite (pump) a molecule, and then to "watch" it react. The wavelength of the pump pulse is tunable from the UV to the near-IR, allowing us to promote molecules of interest to a desired excited state. By controlling the time delay between the pump and probe pulses, we can monitor the evolution of the molecule as it reacts. Our setup allows us to probe chemical reactions occurring on the fs (10-15 s) and ps (10-12 s) timescales. Pump-probe (PP) spectroscopy reveals dynamical information by watching the system evolve on the excited-state potential with time. In some cases, it is desirable to use a second "pump" pulse to selectively re-excite some of the molecules. Depending on the relative delay between the two pump pulses, the secondary excitation might change the outcome of the reaction! This pump-repump-probe (PReP) technique not only redirects the reaction path of the molecule, but also allows us to access new regions of the higher excited states. We are currently using the PReP technique to explore the ring-opening reaction of a diarylethene-based photochromic switch in unprecedented detail. We have demonstrated an increase in reaction yield by exploiting new reaction pathways on the higher excited states that are not accessible from the Franck-Condon region. 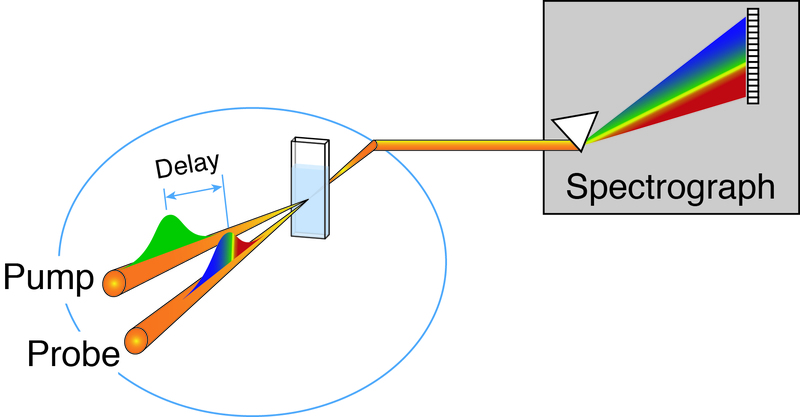 Two-photon pump-probe (2P-PP) spectroscopy is similar to the PP technique described above, except that the initial excitation is induced by the simultaneous absorption of two photons from an intense pump pulse. 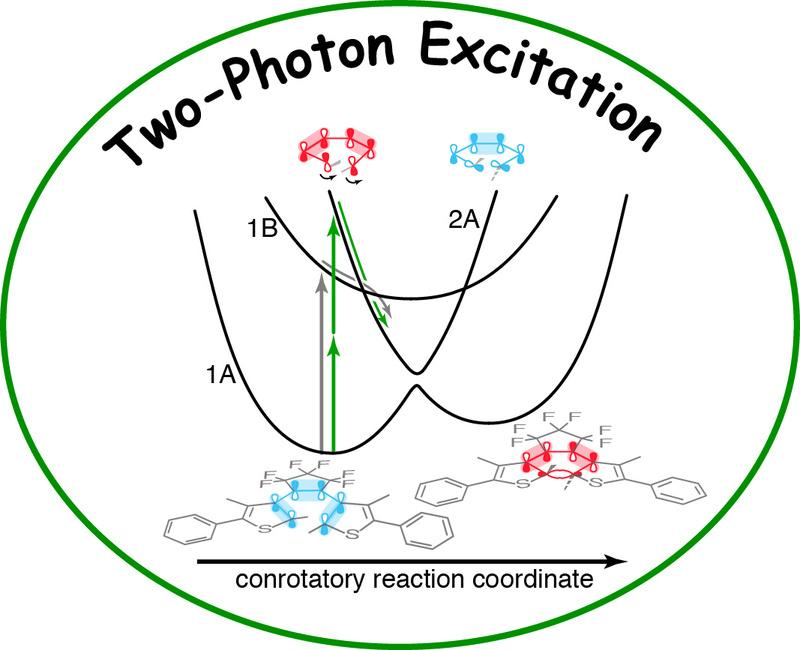 Due to the different symmetry-selection rules for one- versus two-photon excitation​, it is sometimes possible to populate different excited states using 2P-PP. Kristen Burns successfully completes her comprehensive oral exam! Nice work, Kristen! Click here to watch a video of the Physics Colloquium that Chris gave in February. Chris Otolski presents two posters on his work at the 28th Winter Conference of the Inter-American Photochemical Society in Sarasota, Florida. 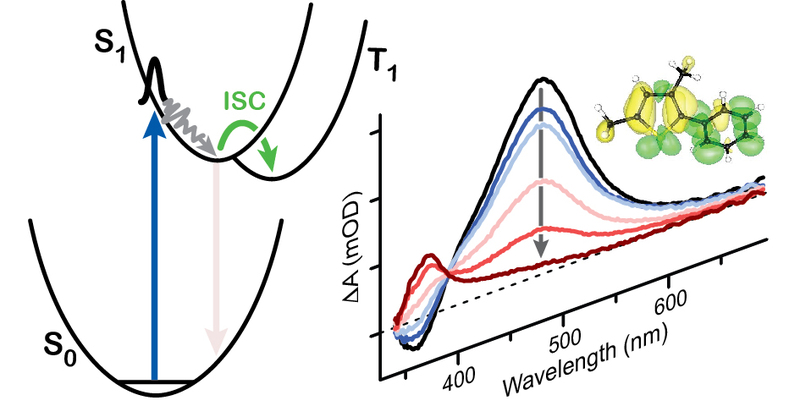 Chris Otolski's paper "Ultrafast Dynamics of Encapsulated Molecules Reveals New Insight on the Photoisomerization Mechanism for Azobenzenes" is accepted for publication in JPC Lett. Group alum and local beer brewer Victoria Gunderson (B.S. 2016) is named a Hawk to Watch. Read her story here.